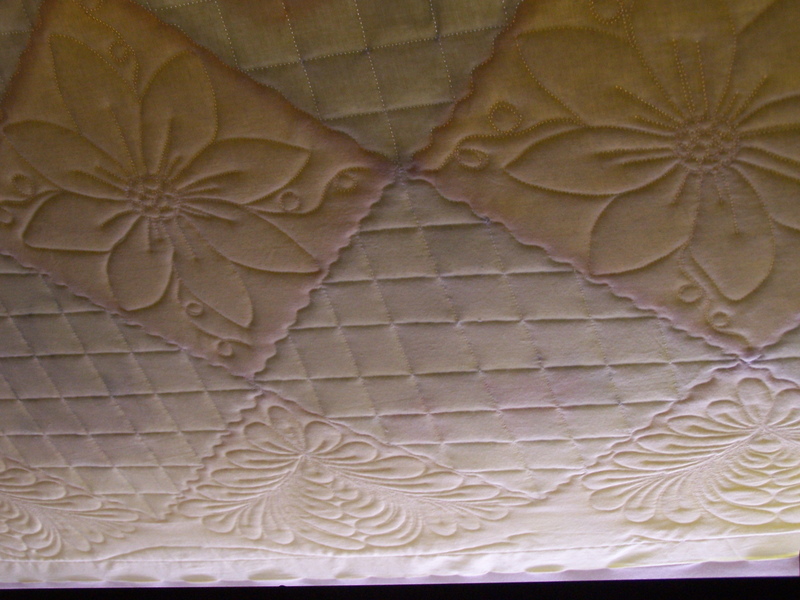 Quilting goals that is. 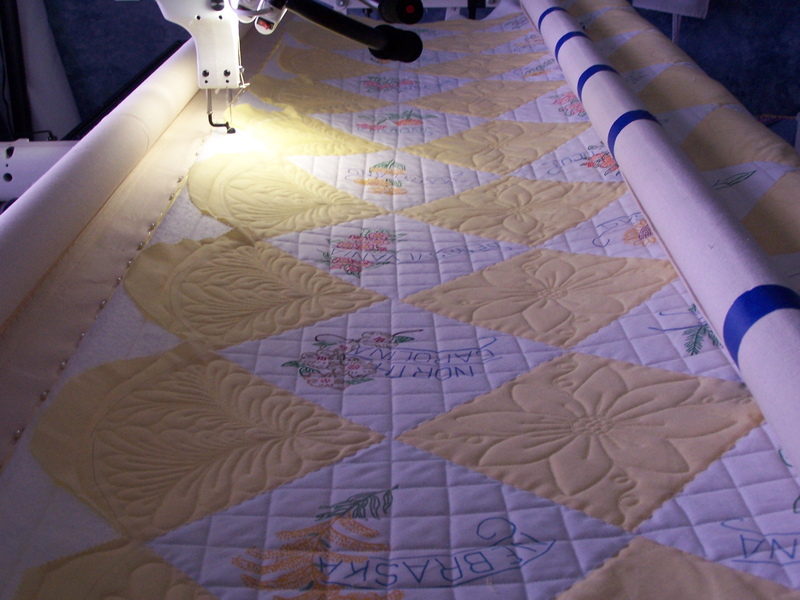 I’m lucky to get any quilting done on Mondays, but I’m trying hard to made good progess on the current customer jobs I have. 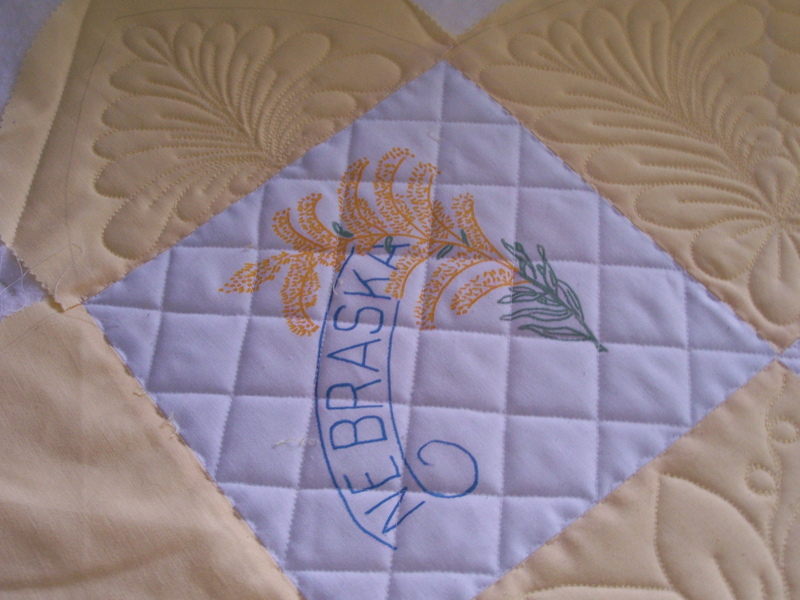 During my lunch break from my day job, I managed to get the binding sewn to the front of the commissioned quilt I’m making. Now the handstitching can begin while I’m watching TV tonight. 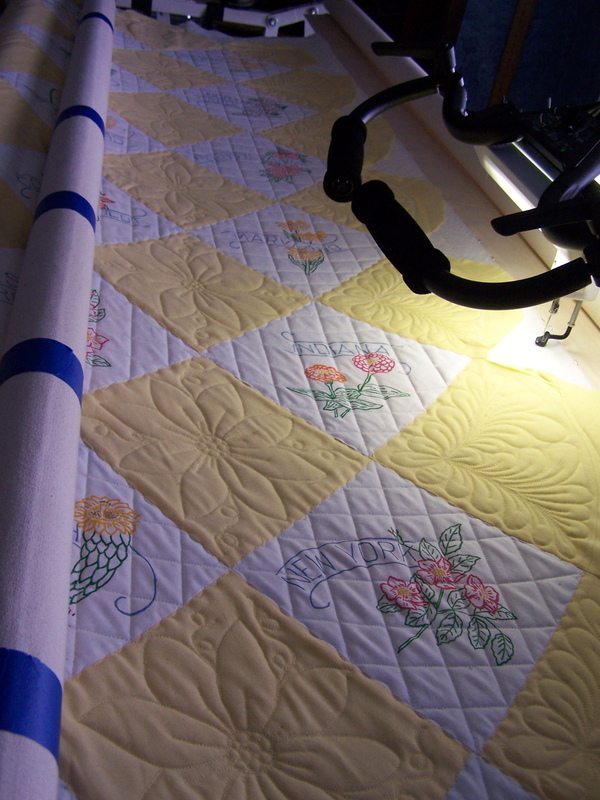 Right after work, I finished up a row on the customer top I’m quilting. It’s the 60 yr. old top I have previously posted. If, and that’s a big if, I can finish up a row a day, between my lunch break and right after work, I can have this one done by the weekend. Unless, I decide it needs some frogging once I get it off the machine. This weekend, I crosshatched the 48 painted flower blocks. I wasn’t thinking about the fact that the blocks don’t all match up perfectly, and they range in size from 8.5 to 9 inches on the sides. Soooo, I’m not sure crosshatching was the right choice, and it’s not perfect, but I’m hoping once it’s off the machine, it will look ok. If you hear screaming, it’s probably me thinking about frogging 48 blocks of crosshatching. What a nightmare that would be. Here’s some peeks at what I have so far. 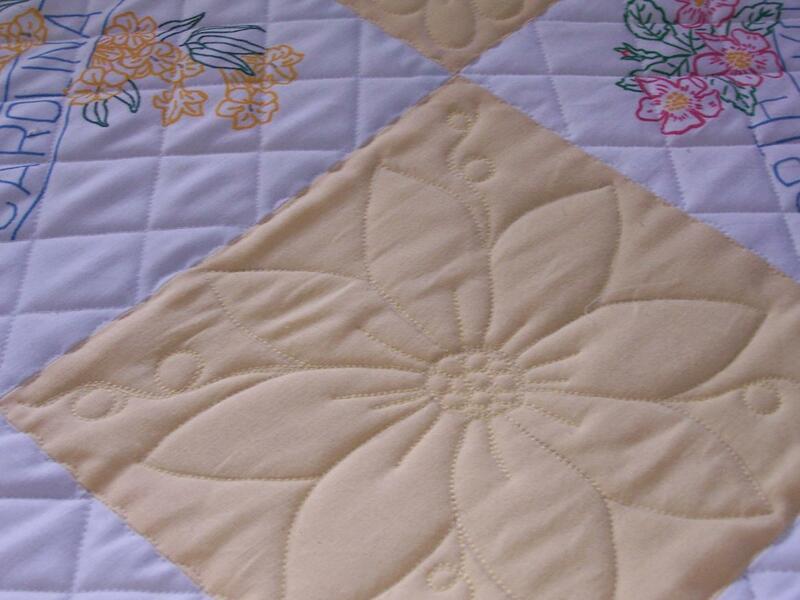 The customer had drawn flowers in the yellow blocks with pencil, and intended to hand quilt this. 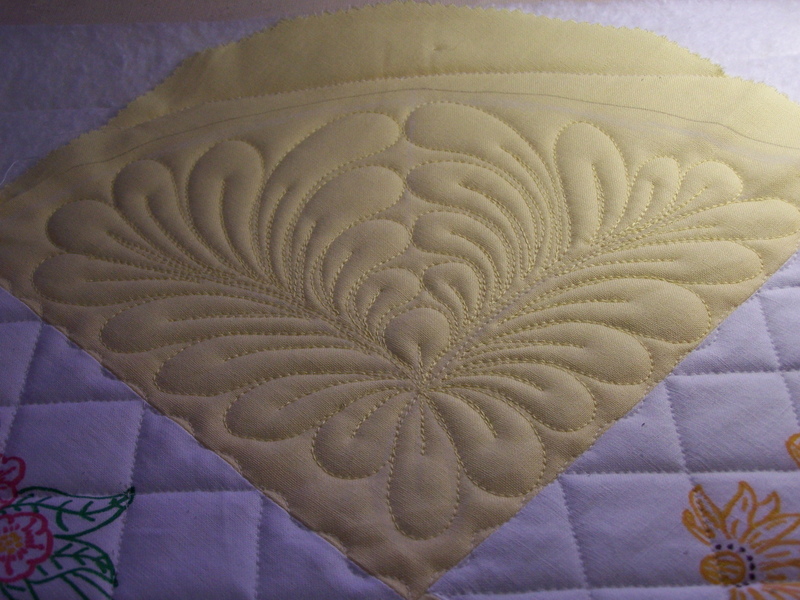 I’m using a fabric eraser to lighten the marks as much as I can, then I’m trying to quilt over them as closely as I can, adding some embellishments of my own.